The Mrs. Yoy Blog: What's up, Switches? A mostly uncensored version of my daily life of being a SAHM and having two young sons and a senile toy poodle. Some days, I barely survive. Other days, I'm freaking awesome. Yoy is my husband's nickname, so naturally, I'm Mrs. Yoy. 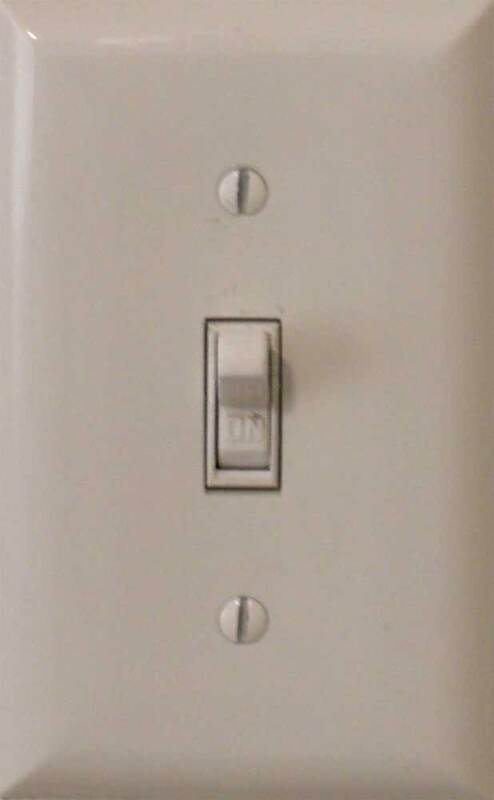 Yeah, I said switches, not the other word that rhymes with it. Big E figured out he is tall enough to reach the light switches and turn them on. Honestly, I thought he'd never get there, he is such a little guy. The problem is, he is not tall enough to flick them back down and turn them off. As I wander from room to room in our house, every single light and fan is going. WE DON'T OWN THE ELECTRIC COMPANY! TURN OFF SOME OF THESE LIGHTS! I feel these wise words bubbling up in my throat. I'm pretty sure this will become my go-to phrase, because Big E is obsessed with the light switches. My only hope is that he shoots up another inch overnight so he can then turn them off. Then it'll be like we are living in a discoteca. See Showering with the Karate Kid. I'm just fumbling my way through motherhood while trying to maintain my sense of humor. Because sometimes you have to laugh to keep yourself from crying into a pillow. A shout out to my readers! Is it too early to discuss Halloween costumes? Today's Topic: What won't Big E eat?